Sunderland FC’s Di Canio Own Goal | Kate Fox. Writer, Broadcaster and Performer: Where There's Muck, There's Bras. You have also compared his supposedly fascist values that he has denied and compared them to extreme Nazi like actions portraying racism as a compulosory skillset on his c.v. If you researched your facts and history books you would see the difference between fascism and what Hitler did. He stated that Mussolini was great leader but his actions vile, he continued in the same passage in his autobiography to further explain his political stance. If you look at the idealology of Italian Fascism you might reconsider your views and improve your seemingly whimiscal amd very biased story, informed by main stream tabloid press. Yes, you have the right to your views, albeit, ill informed. Yes, you’re seemingly a journalist or wannabe of some sort, and yes you have managed to produce more filth for the uneducated massess to believe in. Well done. I personally don’t feel our own democratic system of politics offers much in terms of hope, economic stablilty or peace. 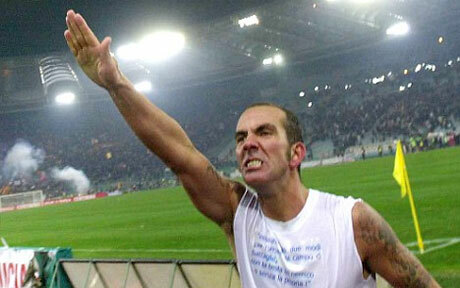 So what is different about Italian Fascism, which doesn’t adhere to a racist creed either. Please go and read his autobiography, don’t blame him for the coalition with the Nazis nor spread his name in unwanted lies and comments which question you’re own professional motives and possible actions of propaganda. Try and write the truth, with references would be good. One great thing about a democracy (as opposed to the Italian Fascism you commend) is that you can post your patronising comment, and I am free to reply to it, to say that I disagree with you.